FILE - A man from Afghanistan carrying a baby cries as he pushes against the fence at the Greece-Macedonia border during a demonstration near the village of Idomeni, northern Greece, Feb. 22, 2016. The Afghan government is finalizing agreements with some European member states and the European Union to handle the return of Afghan refugees, currently in limbo in Greece. The full details of the memoranda of understanding have yet to be announced, but Afghan officials have told VOA that the Afghan government will seek support from the European Union, including financial support, to handle the crisis. "We have been in conversation with our European counterparts and have established a joint technical committee comprised of various organizations and ministries to find a solution to the problem," said Hafizullah Miakhil, spokesperson for the Afghan Ministry of Refugees and Repatriation. "Afghanistan has conditions and demands, including assistance with the returnees, assistance with the Afghan government in the provision of security, and employment opportunities in Afghanistan through establishing vocational institutes in some provinces to train those deported," Miakhil said. 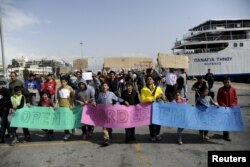 FILE - Stranded Afghan migrants take part in a march to demand the opening of European borders at the port of Piraeus, near Athens, Greece, March 8, 2016. Thousands of Afghan refugees are currently in Greece, where they had hoped to continue traveling into Europe. But under an agreement between Turkey and the EU, all migrants who recently arrived in Greece will be returned to Turkey. For every returnee, Turkey will send one vetted Syrian refugee to be settled in Europe. But the fate of the Afghan refugees is not clear. European governments reclassified Afghans as economic migrants in February, reducing their chances of being able to stay in Europe legally. And Turkey has not said whether it will deport them to their home countries. The disparity has led to clashes between Afghan and Syrian migrants in Greece. The Afghan government had earlier stressed that the country would not accept the “forced deportation" of Afghans from Europe. But Afghan Minister for Foreign Affairs Salahuddin Rabbani told the Afghan parliament recently that efforts were under way to reach an understanding with Europe to slow down the pace and work out a reasonable way for Afghans to return to their country. Europe's financial agreement with Turkey might have prompted the Afghan government to seek financial assistance in handling the Afghan refugee problem. Europe has reportedly granted more than $3 billion in aid for Turkey as part of the refugee agreement. Afghans have cited insecurity and Taliban threats as their reasons for leaving the country. FILE - University teacher Ziaee Shole, center, speaks to Afghan children at the Athens port of Piraeus, on April 1, 2016. "I went to school and university in Afghanistan and had several jobs in the country," Aryan Arya, an Afghan settled in Sweden, told VOA. "The main reason why I left Afghanistan was insecurity. Taliban literally controls 50 percent of Afghanistan, and I know this from my work in the security sector in Afghanistan." Arya added that he is very happy now, and his brother has recently joined him — coming through the same route he took to reach Europe. Sayed Zafar Shah Hashemi, a former employee of the Afghan Independent Election Commission, told VOA that growing insecurity in Afghanistan has made Europe an attractive destination for many Afghan people. However, he warns against the dangerous route and its potential risks — including death. "I have been to the refugee centers and seen Afghans in a very desperate situation," Hashemi told VOA from Austria, where he claimed asylum. "Initially things were good, but now most centers accepting refugees and providing them with welfare have closed." After Syrians, Afghans make up the majority of refugees in Europe, followed by Iraqis. Miakhil, the Afghan refugee ministry spokesperson, told VOA that in 2015 around 250,000 Afghans reached Europe via the Mediterranean Sea. 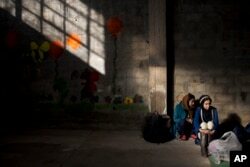 FILE - Two Afghan young women wait to be registered in the Tabakika registration center, Greece, Jan. 15, 2016. "Afghans, along with citizens of countries like Syria and Iraq, make up the bulk of refugees in Europe, and they embarked on dangerous journeys, embracing real risk to their lives," Miakhil said. "Of the 3,400 people that have died on the Mediterranean route in 2015, 12 percent were Afghans." Afghan President Ashraf Ghani angered many Afghans inside the country and overseas when he told the BBC in a recent interview that he "does not have any sympathy with those leaving Afghanistan." "Recent views of the Afghan government, particularly those of the Afghan president, who showed no sympathy with Afghans leaving the country are insulting," said Sayed Maisam Ehsani, a civil society activist in Afghanistan. "Afghans leave the country as a result of the failure of the Afghan government to deliver on their basic promises." Public outrage has prompted the Afghan presidential palace to release a statement saying that the president is proud of many Afghans around the world who have remarkable stories of success.